1.) Stop. No matter how big or small the incident, you must stop. Failure to do so is an offence of the Road Traffic Act 1988 section 170. 2.) Call 999. If the accident is severe with casualties or the vehicles are blocking the road, contact the emergency service immediately. 4.) Contact details. Exchange contact information with the third-party including make and model of vehicle, registration number and insurance details. Call 999 immediately if the third-party leave the scene without giving details. Other information you may wish to collect includes time and date of the incident, witness details, a description of the weather conditions, details of damage to vehicles and a description of any injuries. 5.) Report to police. All car accidents must be reported to the police within 24 hours. Failure to do so could result in a fine, penalty points or even disqualification. 6.) Contact your insurance company. 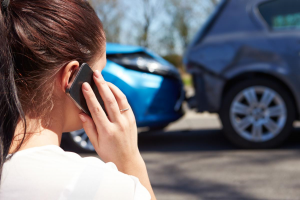 Tell your insurer about the car accident as soon as you can, even if you don’t want to make a claim. Make sure you do so within the time-period set out in your policy. Otherwise this may invalidate your cover and leave you with a big pay out. Also provide third-party and witness information. If you would like to go ahead with your claim, your insurance company will let you know what you need to do next. Remember – it is your choice as to which accident repair centre it goes to and NOT your insurers. It is your policy, your car, your choice. For more information contact your local Steer Automotive Repair centre. 7.) Private Work. If you would like Steer Automotive Group to carry out your vehicle repair work, please contact your local Steer Repair centre directly.